Call 540-251-2543 to schedule your first appointment. Miracle-Ear® wants to be your go-to source for hearing aids in Staunton, VA. The caring hearing care specialists at our independently owned and operated center will assess your needs and introduce you to our hearing aid styles. Many of our customers are impressed with our hearing solutions because of the modern advances found within our GENIUS™ Technology. Our hearing aids offer many features, including systems such as GENIUSfocus and VoiceTarget 360. Our precision hearing support system uses direct focusing on desired sounds, so in noisy situations, you might even understand an individual better than a person with normal hearing. The symptoms of hearing loss can accumulate slowly. If you feel that people are mumbling too often or your ears are ringing, you could be experiencing some of the many signs of hearing loss. To discover and experience the Miracle-Ear® advantage, you'll begin with a free hearing test*. During your assessment, we'll carefully test many variables in your hearing range and identify trouble areas. The next step will be determining the appropriate hearing aid to meet your needs. You'll be fitted with a hearing aid and then begin a 30-day, risk-free trial** period with a money-back guarantee. We'll proudly provide ongoing care to ensure your satisfaction with our products. Even if a problem occurs when you are traveling, you'll have access to dependable customer service at more than 1300 locations nationwide. With our hearing aids, you may be able to improve your quality of life. Conversations could cease to be challenging, and with greater speech recognition, the stress you feel in social situations could melt away. Achieving these results begins with a visit to our Miracle-Ear hearing center in Staunton. To make an appointment, call us today. Chuck has resided in Staunton, VA his entire life. Outside of his professional career with Miracle-Ear, he loves spending his free time with his 2 sons. He is also involved in his church's Music Ministry, and plays the piano regularly for his church services. 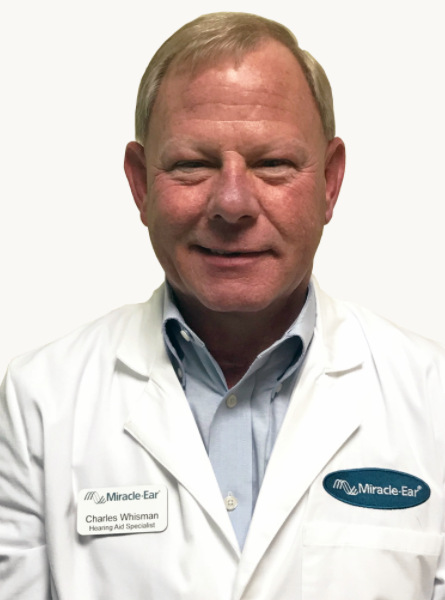 For many years, Chuck owned and operated Wellness Centers, and he now enjoys using his work experience to help folks on their journey to better hearing!